Who doesn’t love lasagna? If you don’t, I’m judging you! 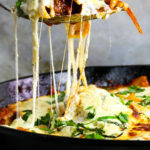 But seriously, this is a really great recipe for you lasagna lovers out there, who may want to put a different spin on it. This is a slightly dumbed-down version of my own lasagna recipe, converted into cute little rolls. I took out a lot of complicated steps and complex ingredients so that you first-time mini-chefs can do this without feeling like a total failure. I am giving you the basics here, so that you can customize to your liking. Be creative and make this recipe yours. This isn’t necessarily a labor-intensive recipe, but it’s not something you want to do at the last minute. 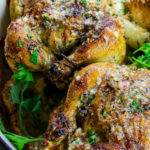 This is the kinda recipe that keeps you in your kitchen for at least 2 hours on and off, prepping and cooking and baking. It’s a labor of love and it’s worth it. 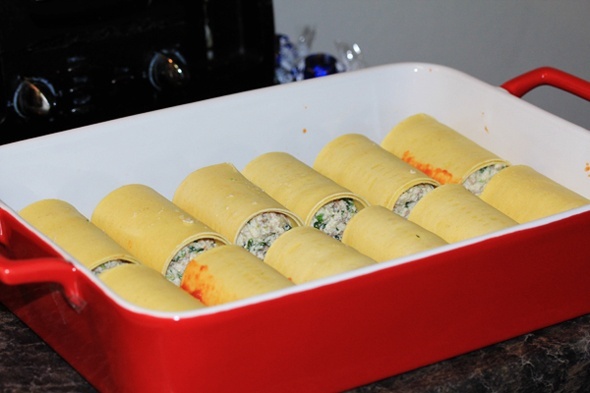 The lasagna rolls are so adorable and delicious, and the perfect serving size. I think you’ll really enjoy them. 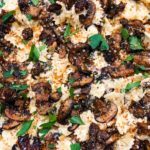 Everyone who’s tried this recipe has loved it, so don’t be intimidated by the lengthy directions or huge list of ingredients. If you’ve made lasagna before, you can do this 😉 I personally don’t use jarred pasta sauces, but if you don’t feel comfortable making your own or are short on time, then feel free to bust out that jar of Prego (or whatever’s hot in the sauce streets these days — please keep the “Swagu” jokes to yourselves lol). This is a hefty dish, but very easy to prepare. Freeze any leftover sauce and cheese mixture in a vacuum sealed freezer bag or airtight container for up to 1 month. salt, pepper and other seasonings to taste, such as granulated garlic, etc. In a large skillet over medium heat, drizzle the olive oil into the hot pan along with the butter. When the butter stars to sizzle, add your chopped shallot. 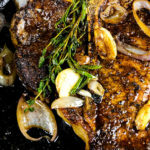 If your shallot is browning too quickly, turn down the heat to about medium-low. Add a dash of salt and pepper to the shallot to help it sweat and bring out its awesome flavor. Let the shallots cook for about 10 minutes, then add your garlic and dried herbs. If the shallot soaked up the oil, drizzle in a little more. Add the italian sausage. Season it with a little salt and pepper and cook until the meat is no longer pink. Drain any residual oil and transfer the meat to another bowl and set aside. In the same large skillet over medium-low heat, add 3 tablespoons of butter to help deglaze those delicious lil bits. Add the chopped sweet onion and let that cook until it’s nice and soft, about 15-20 minutes. Season the onion with salt and pepper and dried herbs then add your garlic. Let that cook for about 5 minutes, then add the can of tomato paste to the pan. Let the tomato paste cook down for about 3 or 5 minutes, mixing it with the onion, garlic and everything else in the pan. Add your crushed tomatoes — slowly. Stir everything, cover and bring to a rapid simmer, then reduce to medium-low. Let this cook for about 20 minutes before you season. Taste it. Add salt, pepper, dried or fresh herbs, or whatever you need to add to make it bomb. Cover the pan and let the tomato sauce simmer over a low heat for about 45min to an hour. Taste it again, and season accordingly if you need to. If after an hour your tomatoes are slightly bitter or super acidic, add about a tablespoon of sugar to offset it. If you use high quality tomatoes, you shouldn’t have that problem, but you never know. Once your tomato sauce is fabulous to your liking, turn off the heat and add 3 tablespoons of butter to the sauce and stir it in so that it finishes it off with a nice sheen and richness. Cover and set to the side. In a big bowl, gently mix the ricotta and remaining cheeses in. Add your fresh or dried herbs. Add the spinach (as much or as little as you’d like). Fold these ingredients together lightly until incorporated. Taste a tiny bit of it and season accordingly if you need to. Finally, add in the italian sausage mixture. Add in a little meat at a time because some people like a lot of meat, some don’t, this is totally up to you. In a separate small dish, lightly beat your eggs and pour that into the cheese and meat mixture. Mix well, but gently. 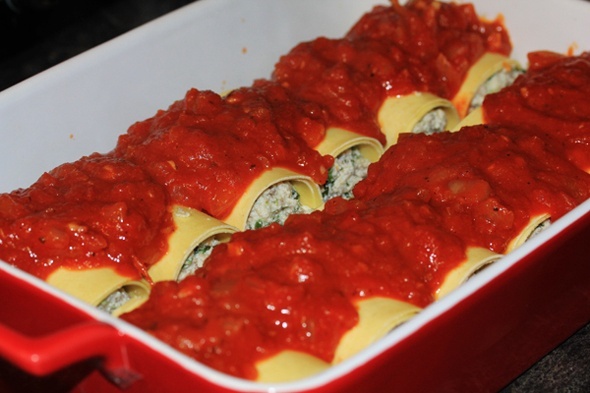 In a baking dish large enough to house your rolls, spread a thin layer of your tomato sauce onto the bottom. Spoon the cheese mixture over one entire lasagna sheet and roll up (like a jellyroll — which, as you can see from the photos, I didn’t do at this particular time, but thats really how you should do it). Place into baking dish seal side down. Repeat with remaining lasagna sheets until your baking dish is full. I cut my lasagna sheets down the middle because they were too long and I wanted to double them. 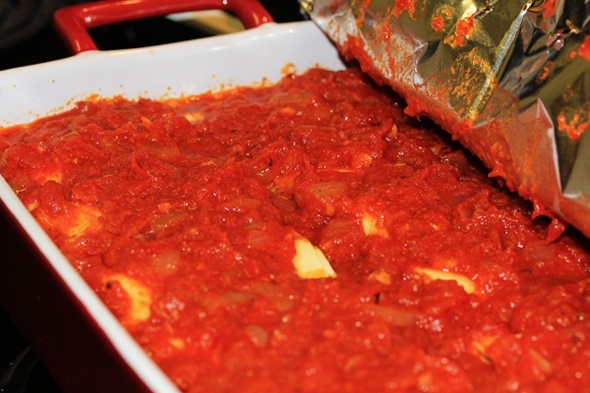 Ladle a generous amount of your tomato sauce on top of your lasagna rolls, cover with aluminum foil. Stab a few holes into the foil with a fork so that the steam can escape, but don’t get all OJ Simpson on your foil, just a few holes. Bake for 25-35 minutes or until the sauce is bubbling and gorgeous. Poke a lasagna roll with a fork, if it easily slides in, it’s ready. Remove from the oven, and sprinkle mozzarella on top of the entire dish. 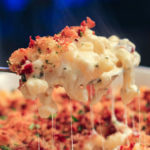 Put it back in the oven for about 10-15min or until cheese is hot, bubbly and gooey. Remove from oven and let it rest for about 15 to 20 minutes before you dive into it. *If you have leftover cheese, freeze it in an airtight container or a freezer bag (remove all the air pls). Do the same w/ any leftover sauce. I have to try this. Oh, & judge my husband, cuz he doesnt like lasagna. 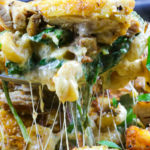 I love, ♥ , LOVE how easily this recipe can be modified! I’ve made this for my man and for my friends and they all loved it! 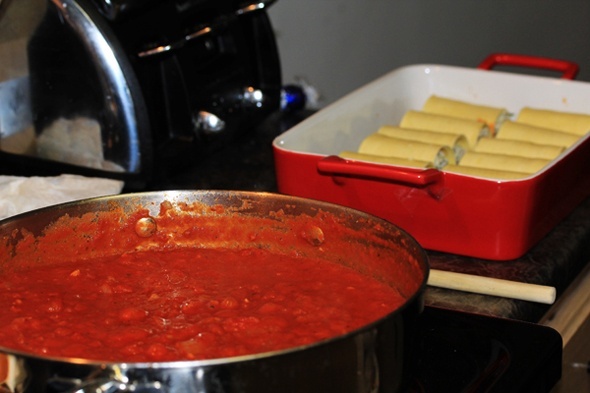 When I can’t get my hands on fresh lasagna, I use manicotti rolls. 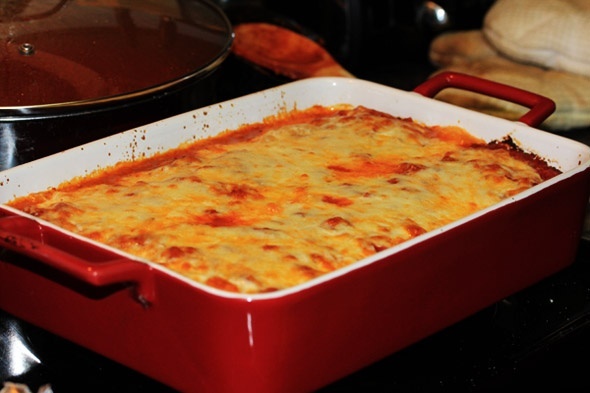 Now…as somone who is NOT a fan of lasagna I read this recipe and was very intrigued! AND of course I was not disappointed whatsoever. This is a great, simple yet DELICIOUS recipe! Definitely one to feed a bigger family or a dinner party! Love it! 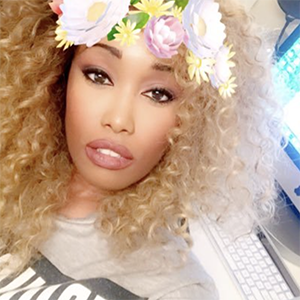 Hey Resha! I saw a post on your Instagram account for lobster and crab stuffed shells. But i wanted to try it with this lasagna recipe. Do you have any suggestions or alterations you think are needed to make it? I’m about four years late, but I made this dish once in 2012. I was feeling ambitious and felt like I could take this on. YOU ARE A GOD SEND. To this day this is the most remarkable, flavorful, spectacular, and awe-inspiring meal I have ever created and I am so thankful. I will be attempting round 2 in a few weeks, which is how I have found myself on this page. Thank you for being so open and willing to share such a masterpiece of a recipe (all of the recipes you’ve shared over the years actually). If you ever publish a cookbook, I will be first in line to purchase. Thank you, thank you, thank you!